In this podcast, Pierre Desrochers discusses his research on the tendencies in free enterprise to make wealth from waste. In May 2012, EJW published a piece by Desrochers that replies to a 2008 criticism by Frank Boons and critically treats work by Christine Meisner Rosen. The same issue of EJW features responses by Boons and by Rosen. In an EJW article, Daniel Sutter and Rex Pjesky asked “Where Would Adam Smith Publish Today?” Their research shows that an overwhelming share of papers appearing in six leading general journals and four leading field journals are mathematical, with 6% of the papers qualifying as ‘math-free’ by the weakest criterion and only 1.5% by the strongest criterion. Here Sutter talks about the findings, noting that Smith, Keynes, Hayek, and Coase might never have broken through had such conditions held in their time. He suggests that perhaps economics has fallen into a homophily among mathematical researchers, resulting in a narrowing of discourse and methods. 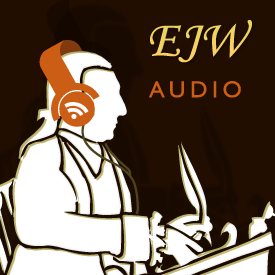 In lieu of a conventional EJW Audio podcast this month, we offer two video confererences in which contributors to the EJW-Mercatus symposium discuss the possibility of a U.S. sovereign debt crisis. Phil Coelho and Jim McClure discuss their research published in EJW and elsewhere showing that top journal papers containing lemmas—intermediate steps in a lengthy proof—are rarely cited by other economists and almost never yield testable propositions. Following Alfred Marshall and Donald F. Gordon, Coelho and McClure argue that longer chains of mathematical reasoning generally have less relevance to understanding real-world economic phenomena. Drawing on his EJW article, Christopher Martin discusses Emma Rothschild’s influential article “Adam Smith and Conservative Economics,” which treats of a parliamentary debate in 1795–96 as giving rise to two contrasting images of Adam Smith. Martin questions the contrast that Rothschild draws, and recurs to the original debate between William Pitt and Samuel Whitbread, as well as to Smith’s own texts. Tawni Ferrarini discusses her paper with James Gwartney and John Morton studying the content of AP® Economics: “Advanced Placement Economics: The Good, the Bad, and the Ugly” (link). The paper and podcast offer constructive criticism for revising the content of the AP Economics materials. Parents, students, and educators involved in AP Economics will profit from the critique.